Welcome to comfort with our Ellington Sectional Seating. Designed with style and comfort in mind, this set makes any occasion special. Ellington offers quality, durability and several configuration options to fit your space and taste. Hand woven with a rich multicolor brown polyethylene wicker wrapped twice around a concealed powder coated aluminum frame. Made from 100% recyclable materials, this PE wicker is cool to the touch and retains its original look for years. The frame is engineered to withstand chlorinated and sea salt environments making it perfect for pool or ocean side use. Sink into Ellington’s deep seating plush all-weather Sunbrella fabric upholstered cushions filled with quick drying foam filling wrapped in polyester for that extra comfort we welcome after a hard day at work. The cushion cover is zippered and may be removed easily for cleaning. This is a truly outdoor cushion. Personalize your area by rearranging the lightweight modular components as an L-shape sectional with a corner, armless and end sections with arm rests. Or, if you prefer, remove the armless sections and make them stand-alone seating. Ellington Seating is part of our full Ellington Collection. Set includes: 1 left arm section, 2 armless chairs, 1 corner chair, 1 right arm section and 1 coffee table • Designed by the Lira Group of designers. 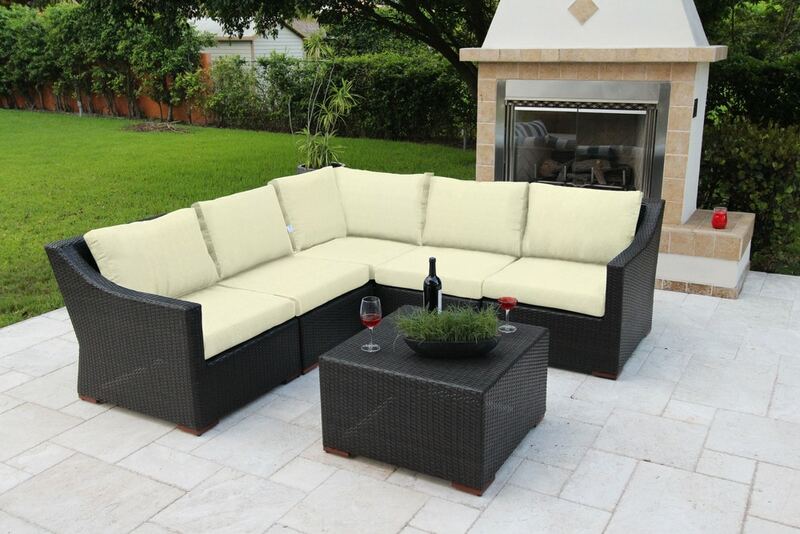 • The Ellington Collection sets the highest standard for quality, comfort and value for outdoor living. • Clean and modern design with a spacious, generous and inviting scale • Engineered to be comfortable and built to be durable using fully welded and powder coated aluminum frames, hand-woven with Noir resin wicker. • Designed to sit deep with ample back and arm support • Modern, clean lines and a fresh, squared shape • Lightweight components are easy to move to fit your outdoor space • Plush four-inch thick Sunbrella® • Modular design to configure for any outdoor space • Personalize your space to create the ultimate outdoor experience. Comfortable by Design • Designed to sit deep with ample back support. • Plush 4-inch, high-density outdoor cushions in Dura-Fast Olefin fabric • High density, quick drying foam cushions enhance comfort and convenience. Contemporary Styling • Modular designs to configure for any outdoor space. Noir Weave • Hand-woven, commercial grade Noir all-weather resin wicker featured in a multi-brown is specially engineered for rugged outdoor use. • UV, weather, and color fast fade resistant. • Woven with a unique process providing years of rich color • Developed to withstand the harsh conditions created by salt and chlorinated environments—perfect for coastal living. • Designed for use in both hot and cold climates. • Environmentally friendly and 100% recyclable. Durable Cushions: • Made using the very best for outdoor; Sunbrella fabric engineered fabric, which is constructed from acrylic thread and solution dyed materials specifically designed for outdoor use. • Unique coloring process is environmentally friendly and provides years of rich, deep color. • Engineered for an extended lifespan of two to ten times longer than conventional fabrics. • Virtually maintenance free, simply rinse it clean with a hose and mild cleanser. • Cushions are machine washable • All-weather cushions have high-resiliency foam core wrapped in plush polyester • For optimal lifetime maintenance, cover furnishings during non-use. Personalize your collection: • Lightweight components are easy to move to fit your outdoor space. • Feet with height adjusters for uneven surfaces • Each piece arrives fully assembled Warranty • 1 year manufacturers limited warranty on the frame Dimensions: Sofa Ends (Left and Right Arm Sections): 28.5 in. Wide x 34.25 in. Deep x 29.5 in. High Armless Chairs: 25.25 in. Wide x 34.25 in. Deep x 29.5 in. High Corner Chairs: 34.25 in. Wide x 34.25 in. Deep x 29.5 in. High Coffee Table: 28 in. Wide x 28 in. Deep x 16.75 in. High Seat Cushion: 4 in. Back Cushion: 5 in. Seat Cushion: 4 in. ; Back Cushion: 5 in.